SeniorsAloud: CHINA - THE LAND OF FAKES? A friend just forwarded an email extolling the benefits of consuming eggs. Apparently various studies have indicated that taking eggs regularly prevents blood clots, lowers the risk of developing cataracts and cancer, promotes healthy hair and nail growth, etc...It's best to take these egg claims with a pinch of salt, until verified and authenticated. Before you start stocking up on your egg supplies, beware of fake eggs being sold to unsuspecting consumers. With the Chinese New Year less than a month away, eggs will be in high demand for baking CNY biscuits and cakes. The Straits Times today carried an article alerting the public of the possible dangers of consuming fake eggs. These are chemically produced by folks out to make a killing on the market as these eggs are produced at a fraction of the cost of real eggs. 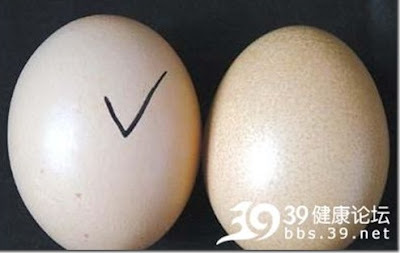 Click on this link to know how to identify fake eggs. From China we have tainted milk, fake organic vegetables, fake wine, fake tofu, fake sausages - what's next? Did someone say 'fake China virgins'?